Obama's ISIS Approach Explained In 7 Minutes : The Two-Way President Obama said stopping attacks like those in Brussels is "difficult work." His advisers, he said, are working on "every strategy possible." 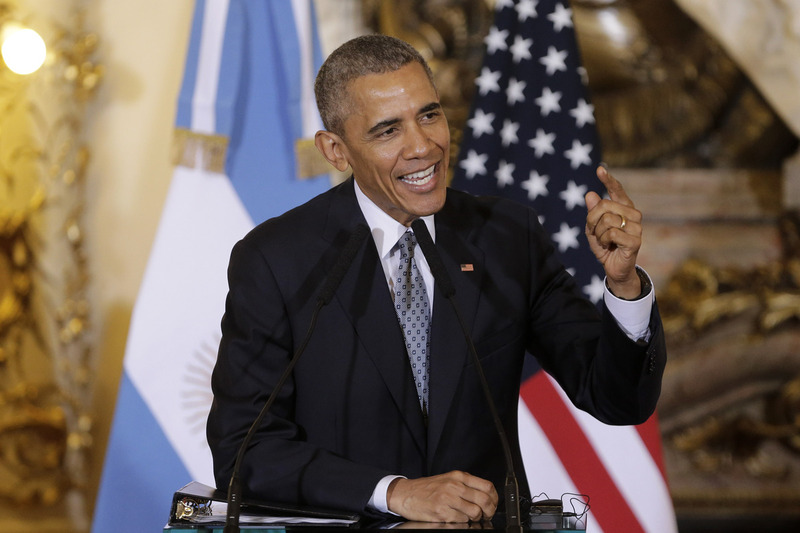 President Obama answers questions during a joint news conference with Argentine President Mauricio Macri at the Casa Rosada Presidential Palace in Buenos Aires on Wednesday. During a press conference in Argentina, President Obama laid out how his administration is handling the Islamic State. He said the U.S. is making gains in Iraq and Syria, but stopping attacks like those in Brussels is "difficult work." "It's not because we don't have the best and the brightest working on it," he said. "It's not because we're not taking the threat serious; it's because it's challenging to find, identify very small groups of people who are willing to die themselves and can walk into a crowd and detonate a bomb. ... My charge to my team is: Find every strategy possible to successfully reduce the risk of such terrorist attacks even as we go after their beating heart in places like Iraq and Syria."